The visit to Saona Island is the excursion that everyone recommends when they know that you are visiting the Dominican Republic, it really is a heaven on earth !, almost idyllic for its landscapes and the transparency of its waters. Saona Island is located in the southeastern end of the Dominican Republic, is the largest of the Dominican Republic's islands, is part of the Eastern National Park and serves as a sanctuary for several species of migratory birds. Originally its name was "Adamanay", is an aboriginal primitive name. On the second voyage from Don Christopher Columbus to Hispaniola Island, he was accompanied by an Italian from Savona, an Italian region. This Italian was the one who discovered the Island and Don Christopher Columbus wanted to baptize his honor, calling it with the name: "Savona Island". For years, the inhabitants of the Island were the name difficult to pronounce, reason why they changed the name for: "Isla Saona". Saona Island also has interesting caves, such as Cotubanama named in memory of the proud indigenous chief of this region who was captured by the Spanish conquerors and executed in Santo Domingo. One of the few populated areas of this national park, Saona Island has a picturesque settlement called Mano Juan. This fishing village with its pastel wood houses is also a craft center. On Saona Island we will find kilometers of solitary beaches with crystal clear white sands and surrounded by millions of coconut palms, we can find some caves that recall the presence of the native Tainos, coral reefs ideal for diving and fish and shellfish farms, Has the "Natural Pool", is an area of ​​crystal clear water that can be seen in the background innumerable species such as the stars of sea among others, and birds such as flamenco. There are 112 species of birds within the limits of the park, half of which correspond to species in the country. Of this total, 8 species are endemic to the island and 11 endemic species of the Caribbean area. The manatee is a marine mammal in danger of extinction. There is also the dolphin. .
Saona Island has a surface area of ​​110 km/sq, its population, which is concentrated in the town of Mano Juan, is of approximately 500 inhabitants with only 69 houses of families, live of the fishing and are hospitable, friendly and very receptive with the Visitors, do not forget to bring some candy for the kids, they love it. The beaches of Isla Saona were selected among the best beaches of the Caribbean by Caribbean Travel & Life magazine. 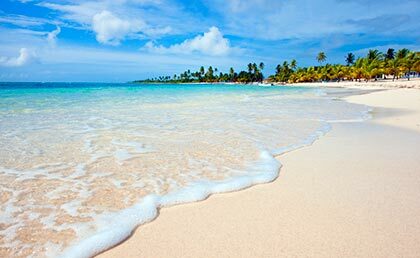 Its beaches are spectacular, unspoiled, with lush palm trees and turquoise waters that make them one of the most beautiful regions of the Dominican Republic. Colonial Tour and Travel has several types of excursions to Saona Island which we describe below and you can book online, directly with our assistants in hotels or by calling our different offices in the Dominican Republic..
Colonial Tour and Travel offers you this tour to Isla Saona, considered as on of best excursion in the Dominican Republic, starting from the Punta Cana-Bavaro, La Romana-Bayahibe, Juan Dolio, Boca Chica or Santo Domingo hotels from 6:00 am, in comfortable air conditioned buses, we will arrive at the picturesque town of Bayahibe early in the morning. 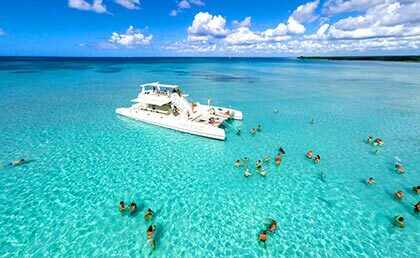 From the beach of Bayahibe we will embark on a beautiful catamaran or on speedboats with all security measures and accompanied by expert multilingual tour guides. During the trip to Saona Island, on the catamaran you can enjoy snacks, national alcoholic drinks, water and soda as well as taste the exquisite tropical fruits. 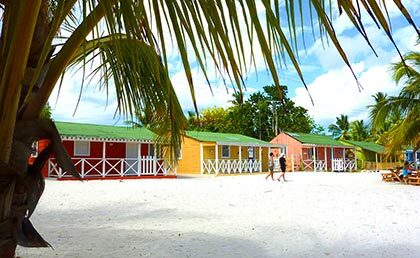 Immediately you will enjoy the beautiful views of the real Caribbean and its transparent waters with salt-white sand until you reach the famous Saona Island near 11:00 am. It is customary for hikers to bring some candy to give to children from the small fishing villages that live on the Island. We will have time to take a delicious bath in its clean and crystalline waters, classified by Caribbean & Life among the best beaches in the world. In one of the beaches of the island we have a special area reserved for clients of Colonial Tour and Travel with chaise longues while some people will enjoy animation and classes of Merengue and Salsa with our staff of animators and others will be collecting snails or taking photos of the beach. But .... it's about 1:30 p.m. and it strikes us a little hungry. 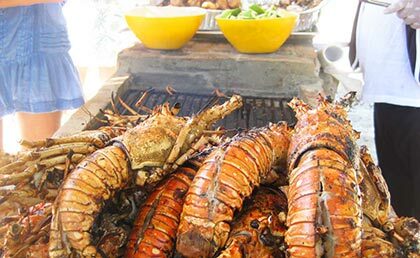 In a covered restaurant area with beautiful palapas and palm trees we will have a delicious buffet based on spaghetti with lobster, fish, chops, grilled chicken, green and Russian salads, white rice and vegetables, tropical fruits and vegetables, coffee and drink Premises included. We will spend that magnificent lunch taking the soft breeze of the Island and talking with the hospitable islanders or we will take a nap on the beach, walk along the beach and take many photos. At 2:30 p.m., we will return in comfortable and safe speedboats and it is almost obligatory to visit the beautiful mangroves, attached to the Catuano Channel, which separates the Saona Island from the mainland. Where we will see a bank of fish of all colors that come to the boats waiting for us to throw a piece of bread. Then we continue to the largest sandbank in the area called La Piscina Natural, this part is a dream, people are astounded by such beauty, here are many marine species, especially the starfish. The captain of the boat or our guide launches to look for starfish, raises them to the surface so that you can take some photos and return them to their surroundings. 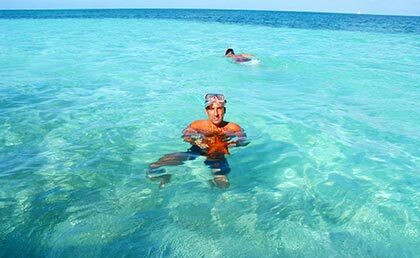 The largest natural swimming pool in the world, so called for its shallow depth of less than 1 meter, crystal clear water, sand bank and 400 meters from the coast in the middle of the sea. 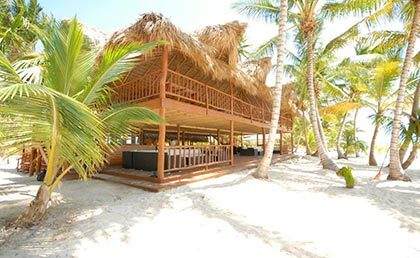 It is there where the most charming toast is made, a true dream of the Caribbean, accompanied by a drink of Dominican rum or mamajuana. We will finish arriving at the port of Bayahibe and our buses will take us back to the hotels where we will arrive around 6:00 pm. It is a spectacular day and most people take this tour more than 2 times. 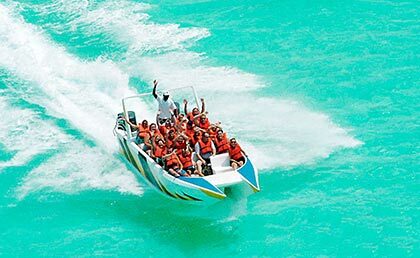 The duration of this excursion from the departure of the excursions is 8 to 9 hours from the departure of the hotel. What does the Saona Island tour include ? 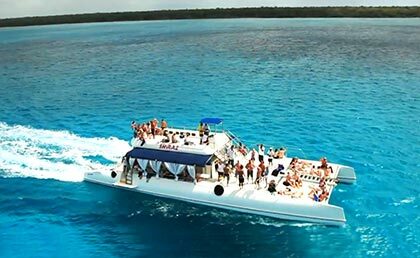 -Boat in Bayahibe on a magnificent catamaran or on speedboats with all security measures up to Saona Island. -Parada in the Natural Pool to taste a toast with local drinks and take photos to the stars. Book Saona Island tour now !